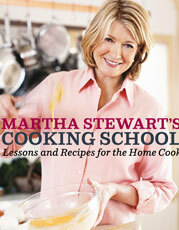 Martha Stewart offers home cooks a culinary master class which covers everything from roasting and poaching to braising and blanching. In each 30-minute episode, Martha uses her signature step-by-step, how-to teaching process to illustrate classic cooking techniques as well as the basics every cook should know. Lessons include making marinara sauce with four ingredients, butchering a beef tenderloin, cooking chicken breasts in parchment paper and how to determine which meats are good for braising.